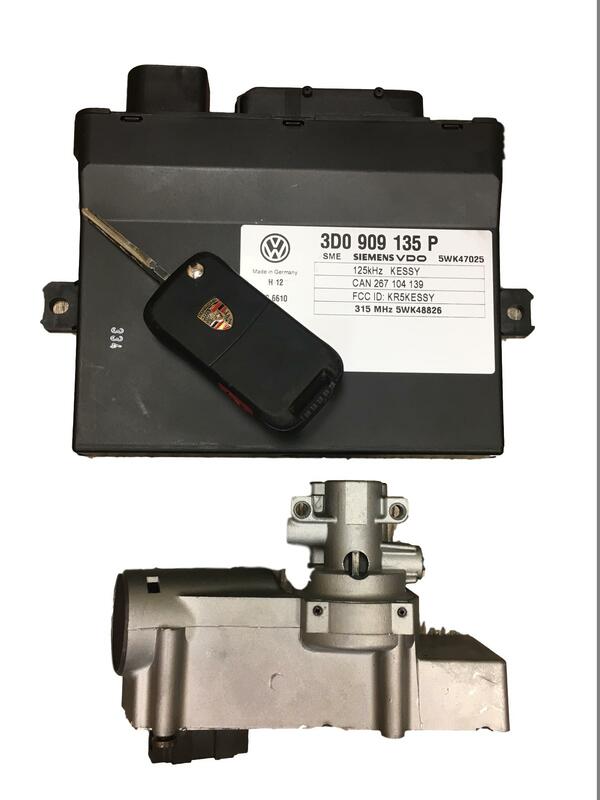 Complete Remanufacture Service for Audi A8, Porsche Cayenne, VW Touareg / Phaeton Steering Lock Mechanism. The steering lock module is integrated in the steering column. Failure is typically identified by no response from key in the ignition, or proximity access (Start button), accompanied by "Steering Faulty" message on driver info display. The Steering Lock (along with the Immobilizer Box - Kessy, and Electronic Ignition Switch) is responsible for key/transponder recognition, unlocking/locking of steering wheel and powering up all modules in the vehicle. If there is an issue with any of the lock module components (actuator motor, relay, etc) or the integrated Immobilizer system Microprocessor/PCB, the module will not provide power to Terminal 15 (ignition on), which results in no ignition and no engine start. The Immobilizer / Kessy control module will typically store "00288 - Steering Column Lock Actuator (N360) - Defective" fault. Remanufacture Service covers Repair or Replacement (with identity/configuration cloning) of the Steering Lock module. The module can be separated from the steering column and serviced (we can provide removal instructions). By dealer standard, the module itself isn't a serviceable item and can't be purchased separately, which means that the dealer will want to replace the entire steering column along with the Steering Lock (and in some instances the Kessy control module). The dealer MSRP to replace the steering column that integrates module is roughly $1500 (depending on manual or electric height adj) for parts and $900+ labor, including the need for online Immobilizer coding with VW master servers in Germany. Module is completely remanufactured to factory spec and function, using only Genuine/OEM components and fully bench tested in our lab. All commonly failing components are replaced. Module is returned Plug and Play. No additional coding is required upon reinstall. Requires removal and shipping of Steering Lock Module (or the entire Steering Column), along with the Start Access / Kessy Control Module and one working Key.